I am currently teaching a class at the University of Chicago on hyperbolic groups, and I have just introduced the concept of -hyperbolic (geodesic) metric spaces. A geodesic metrix space is -hyperbolic if for any geodesic triangle , and any there is some with . The quintessential -hyperbolic space is the hyperbolic plane, the unique (up to isometry) simply-connected complete Riemannian 2-manifold of constant curvature . 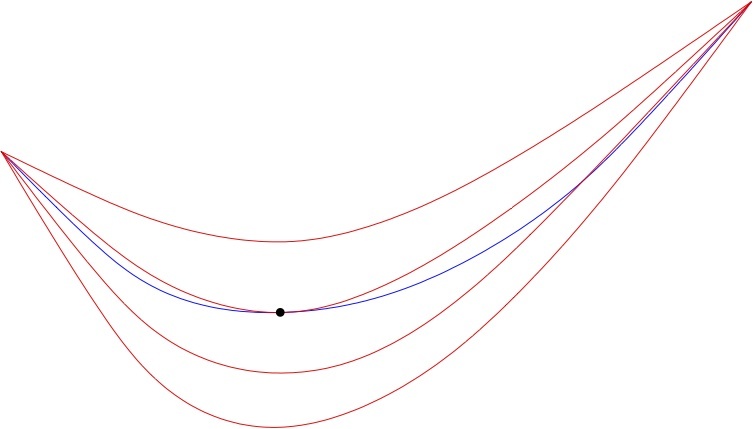 It follows that any simply-connected complete Riemannian manifold of constant curvature is -hyperbolic for some depending on ; roughly one can take . What gives this condition some power is the rich class of examples of spaces which are -hyperbolic for some . One very important class of examples are simply-connected complete Riemannian manifolds with upper curvature bounds. Such spaces enjoy a very strong comparison property with simply-connected spaces of constant curvature, and are therefore the prime examples of what are known as CAT(K) spaces. Definition: A geodesic metric space is said to be , if the following holds. If is a geodesic triangle in , let be a comparison triangle in a simply connected complete Riemannian manifold of constant curvature . Being a comparison triangle means just that the length of is equal to the length of and so on. For any there is a corresponding point in the comparison edge which is the same distance from and as is from and respectively. The condition says, for all as above, and all , there is an inequality . CAT(K) Theorem: Let be a complete simply-connected Riemannian manifold with sectional curvature everywhere. Then with its induced Riemannian (path) metric is . This theorem is very familiar to people working in coarse geometry, especially geometric group theorists. Because it is really a theorem in Riemannian geometry, rather than coarse geometry per se, its proof is often omitted in expositions of the theory; for example, I don’t believe there is a proof in Gromov-Ballmann-Schroeder or Ballmann (I think it is relegated to the exercises), nor is there a proof in Cheeger-Ebin, although one can piece together an argument from some of the ingredients in this last volume. Therefore I thought it might be a useful exercise to give a more-or-less complete exposition, which is reasonably self-contained and complete (Update: Daniel Groves tells me there is a proof in Bridson-Haefliger, which is good to know). Part of what makes this a slightly fiddly theorem to prove is that one must somehow connect up the algebraic language of local Riemannian geometry with the metric language of distances, triangles, convexity and so on. The argument breaks up nicely into two parts — an infinitesimal comparison which is proved algebraically, and a global comparison which is derived from the local comparison by a “soft” argument. The first, algebraic part is not very deep, but it does contain an interesting nugget or two, which I will try to explain as I go along. The denominator of this expression is the area of a parallelogram spanned by and , so if are orthogonal and of length 1, it reduces to 1. If is a point, and is a tangent vector at that point, there is a unique geodesic with and . If is complete, is defined; thus there is an exponential map from to taking to . If is the subspace of spanned by a vector , and , then we can define a vector field along by setting it equal to at , for some constant and for all . The exponential map pushes this vector field forward to a vector field on along , called a Jacobi field; by its construction, a Jacobi field is tangent to a 1-parameter variation of geodesics. A Jacobi field satisfies the Jacobi equation . By abuse of notation, one identifies the frames along by parallel transport, and writes this as . where the last inequality is just Cauchy-Schwarz. along , by the Jacobi equation applied to . Hence is constant along , and one sees that it contributes a term which depends only on the angle . Lets abbreviate . Another simple calculation (see Cheeger-Ebin pp.24-25) shows that if for any function with then ; this is one of the fundamental (and standard) index lemmas, which say that in a suitable sense, Jacobi fields minimize the form . and we conclude that the distance function to geodesics is more convex in than in the comparison space . This is the desired infinitesimal comparison theorem; it remains to bootstrap it to a global comparison theorem. We know and . We would like to show pointwise. Suppose not, and restrict to a maximal connected interval on which this fails. By the infinitesimal comparison theorem proved above, this interval must have nonempty interior. Let and be the points on and corresponding to the endpoints of the interval. Evidently the triangles and are also comparison triangles; so WLOG we may just take , and so on. We now employ a trick. Consider a 1-parameter family of comparison triangles in spaces of constant curvature . The CAT(K) Theorem for spaces of constant curvature reduces to an explicit calculation, since the function as above can be computed exactly, and we suppose the theorem proved for such spaces. It follows that as increases, the function also increases monotonically. By assumption, for small there is some with . Eventually therefore we get some and some intermediate where and for all points near . But this contradicts the infinitesimal comparison theorem proved above. qed. The figure above illustrates the meaning of the last step. The blue curve is the graph of , and the red curves are the graphs of for various . As is increased, the red curves move upward in a family. There is some biggest for which the red curve is not entirely above the blue curve, and for that curve, the red and blue curves have a point of tangency. But at that point of tangency we would have , contrary to the infinitesimal comparison theorem which shows with equality iff the curvatures along the corresponding geodesics are pointwise equal, which they are not for . This entry was posted in Hyperbolic geometry, Surfaces and tagged CAT(K), comparison geometry, convexity, Jacobi fields, nonpositive curvature, Riemannian geometry. Bookmark the permalink. Thanks for posting this; it is a nice exposition. The one parameter family of geodesics is presumably from to , and not from .